Just opened at Climpson's Arch near London Fields is Som Saa, a new residency serving little known dishes from Northern and North Eastern Thailand, like Gaeng hung lay - Northern style pork curry with pickled garlic and ginger - together with some special cocktails including Muay Thai Kick, a knockout combination of Gin, Thai basil, lime, sugar and basil seeds. It's open weekly until early 2015 from Thursday to Sunday, and sounds like a great addition to the area! 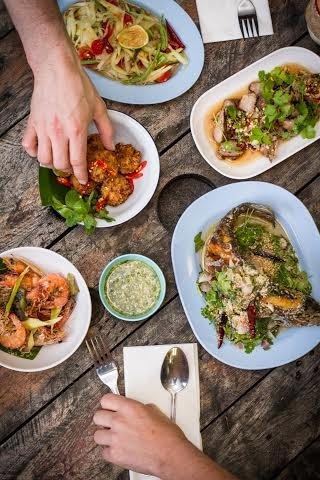 "Opening on Saturday the 25th October, som saa, founded by Andy Oliver and Tom George, will serve lesser-known dishes from the Northern and North-Eastern provinces of Thailand utilising the charcoal grills and wood fired oven at the well known spot in London Fields. The pair have transformed the Arch into a 40 seat bar and restaurant with a warm and buzzy atmosphere. Open Thursday through Sunday, som saa will serve everything from sharing dishes for four, to fiery Thai bar snacks, all doused with Asian inspired cocktails and a range of craft beer and wine. With retro Thai decor, truly authentic flavours from the kitchen and memorable drinks, the experience will transport visitors to small town Thailand for the night. Classic Thai brunch dishes such as Chinese doughnuts and rice porridge with crispy pork will be served at weekends, alongside a special Thai coffee developed in conjunction with Climpson and Sons Coffee Roasters. Andy is an experienced chef who has built a deep understanding of Thai cuisine and culture having worked in Thai kitchens for nearly a decade. He trained under David Thompson at the Michelin starred Nahm and at Bo.lan in Bangkok. At the Arch, Andy has developed a menu that reflects his personal passion for the rustic cuisine of the Northern and North-Eastern provinces. It embraces a style of shared eating that is simply the norm in rural and provincial Thailand. Its rumoured Santa will be bringing the kitchen an imported chinese wok burner for xmas. If so, expect to see it used for some new specials – and then perhaps for some permanent dishes too. The bar will also see an injection of fresh ideas for 2015. We’ve been seeking out unusual ingredients, new beers and rare wines. - Some rare vintage rieslings by the glass.